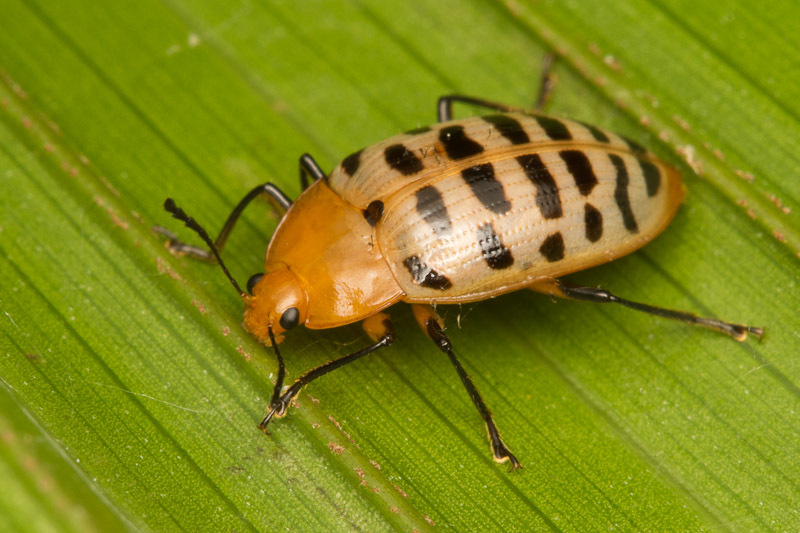 While I work on some longer posts, here’s another attractive unidentified beetle to ponder. Maybe a pleasing fungus beetle in the family Erotylidae? Lacordaire included nine species in this genus, which is characterized by the thinness of the antennae, and their comparative length—in this respect resembling, but often surpassing, those of the Scaphidomorphi and Prepophari. The elytra are at the same time very parallel, and often have their apices truncate or even serrate, and are sometimes spotted with black in a peculiar manner. … Altogether, of true Prioteli, about twenty species are described. They appear to be almost exclusively confined to the tropics of South America; but one species, originally described from Mexico, is distributed all over Central America, and, according to Lacordaire, extends its range to Colombia. Hab. Mexico 1 3, Toxpam, Catemaco, Santecomapan (Salle), Jalapa, Tapachula in Chiapas (Hoge), Teapa in Tabasco (H. H. Smith); British Honduras, R. Hondo (Blancaneaux) ; Guatemala, El Reposo, San Isidro, Zapote, Purula, Panima, San Juan in Vera Paz, Sabo (Champion)-, Nicaragua, Chontales (Belt); Costa Rica, Cache (Rogers); Panama, Bugaba (Champion).—Colombia2. Numerous specimens of this species have been sent; these vary in length from seven to twelve millimetres. In most examples the thorax has two dots in front and one very small one immediately before the scutellum on the base; but in some, as in those from Chontales, it is spotless. P. apiatus is very like P. tigrinipennis, Lac, from Colombia; but differs from it in the apex of the elytra being entire, instead of being obliquely truncate…. An individual from El Reposo is figured. Excellent, Patrick. That does indeed look like a good match. Thanks for the links! If this is that species, it looks like the revised name is Neopriotelus apiatus. I did see some similar-patterned Erotylids on the other BCA plates for that family, but that does look like the best match–esp. the long, thin antennae, mentioned as a character for the genus.